A fatal occurrence during the Easter Rising links Carlow and London in a strange way. Carlow historian Prof Paul Horan explains why parliamentary questions were raised in the House of Commons on the tragic death of a Leighlinbridge nurse killed by enemy fire during the historic week. 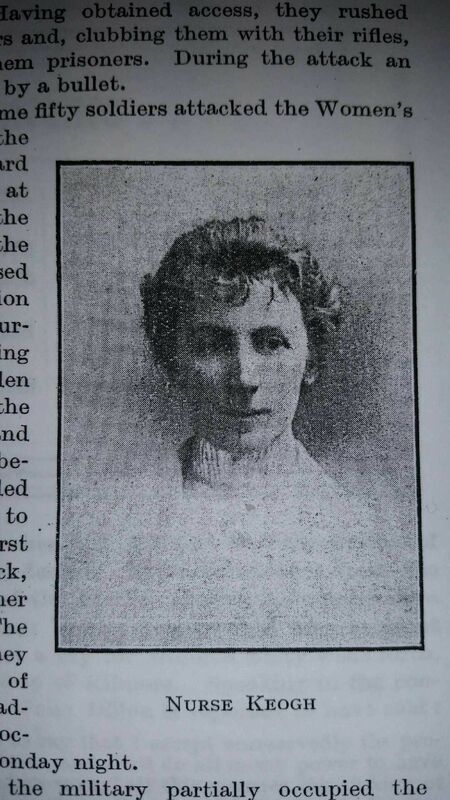 Nurse Margaret Keogh died from gunshot wounds sustained in the doorway of The Acute Hospital or Hospital 3 of The South Dublin Union at around lunchtime on April 24th 1916. It is likely that she was mistakenly shot by soldiers of The Royal Irish Regiment who were clearing the hospital grounds of insurgents identified later as Jim Kenny and Dan McCarthy. Nurse Keogh sustained stomach wounds and shot through the heart also. It is understood she died instantly. Her body was placed on a table in the ground floor of Hospital 3 by soldiers of The Royal Irish Regiment at the request of one of her nursing colleagues beside the wounded Volunteer Dan McCarthy. Some accounts suggest that Nurse Keogh was attending to a wounded volunteer who could possibly have been Dan McCarthy. Other accounts suggest that Nurse Keogh had descended the stairs from the second floor of the Hospital 3 building where she and another nursing colleague had been taken cover from the gunfire and that as she reached the last step of the stairs she was shot through a glass door. Whatever actually occurred the fact remains that a nurse in full uniform was shot by soldiers of an Irish Regiment of the British Army at complete odds with the rules of the conduct of War. County Carlow’s Heroine of 1916 Nurse Margaret Kehoe was called the ‘first martyr of 1916′ by Commandant Eamonn Ceannt the executed 1916 during hostilities at The South Dublin Union now the site of St.James Hospital and The Trinity Centre for Health Sciences on James Street in Dublin. In essence an innocent nurse was murdered by gun shots to the abdomen fired by soldiers of The Royal Irish Regiment when she was rushing to attend patients or to the aid of a casualty of the conflict in the vicinity of The Acute Hospital/Hospital 3 of the South Dublin Union in the course of her nursing duty. Volunteer Dan McCarthy was also wounded in the melee by gunshots. Dan McCarthy went on to become a significant Sinn Fein party organiser, a TD and Junior Minister in the first Free State government and President of The GAA from 1921 – 1924. There is another Carlow link to the story recounted in a revelation by Dan McCarthy in his Bureau of Military Archives witness statement, he himself states that his injuries were initially attended to in the South Dublin Union and later in the week he was transferred to the Red Cross Field Hospital in Dublin Castle into the care Surgeon William Steele Haughton. Surgeon Haughton the son of the Carlow born Rev.Dr. Samuel Haughton the Trinity College Dublin polymath who developed the infamous formula for a more efficient form of Hanging offered to the world in his 1866 paper simply entitled ‘On Hanging’. Surgeon Samuel Steele Haughton would go on to become Professor of Orthopaedics at Trinity College Dublin and is reputed was being the man who introduced X-Rays to Ireland. • Dan McCarthy, an Irish Volunteer of ‘D’ Company 4th Battalion, Dublin Brigade Irish Volunteers on Active Service Easter Week 1916 at the South Dublin Union. • Patrick Smyth a Ward Master, South Dublin Union. • Annie Mannion The Assistant Matron of the South Dublin Union. Patrick Smyth in his statement briefly suggests that.. About 1.30 p. m. He heard from a member of the Staff that Nurse Keogh had been shot while rushing down stairs to take in her patients who were out in the yard. he I was also informed that she had been shot through a glass door by British forces. Annie Mannion The Assistant Matron of the Dublin Union at the time suggested in her statement.. The one building she did remember definitely that the Volunteers occupied was what is now known as the Acute Hospital, that is the building opposite the Convent where Nurse Keogh was shot by the British military. 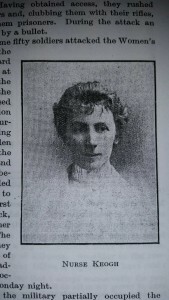 The Nationalist and Leinster Times in May 1916 carried Nurse Keogh’s death notice clearly stating that Nurse Keogh died embarking on her duties, another report in the paper states that nature of Margaret’s injuries were extensive and that she was ‘blown to pieces’. The Nationalist and Leinster Times also provided coverage of County Council Vote of Condolence on Nurse Kehoe’s Death on May 13th 1916. In many ways my ancestor my great grand uncle James Reddy who was the Managing Director of The Nationalist and Leinster Times and his staff have left a remarkable social history of what occurred during and and in the aftermath of the Rising. The circumstances of Nurse Kehoe’s death were inquired about in a Parliamentary Question at the Houses of Parliament on June 22nd by Mr.Ginnell MP of The Irish Parliamentary Party to Prime Minister Asquith MP. 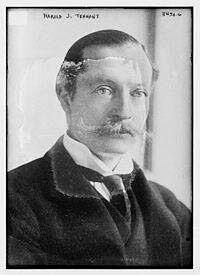 HANSARD 22 June 1916 House of Commons Sitting addressing matters concerning DISTURBANCES IN IRELAND. 68. 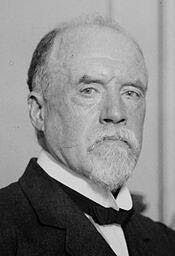 Mr. GINNELL asked the Prime Minister whether the officer who gave the order to shoot any person entering a certain corridor of the South Dublin Union, or the soldier who in obedience to that order shot Nurse Kehoe through the heart, has yet been tried by any Court, civil or military; whether any notice was given to the nursing staff to avoid the corridor in 304 question; whether Nurse Kehoe was when shot wearing her nursing uniform; whether there was any reason for thinking she was acting in any other capacity than that of a nurse; whether the King’s Regulations empower any officer to order the shooting of, or any soldier to shoot through the heart, a nurse wearing her uniform and practising her profession; and what the intention of the Government is with regard to this case? The circumstances connected with this case have been very carefully and exhaustively inquired into, the evidence of military and also civilian witnesses having been taken. It has been definitely ascertained that this most regrettable incident was a pure accident. The remaining portions of the question do not therefore arise.